Jamster has become slightly obsessed with those 4 heroes in a half shell and from the moment he rises to the second he conks out in bed he is talking turtles. He came home from school on Friday with his usual reading, times tables and spellings to work through but also with his first homework sheet for the new school year. The turtles picked up the sword from the sewers. 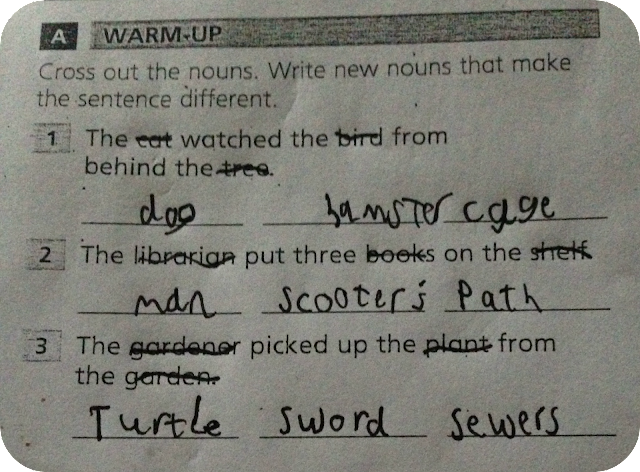 I didn't expect him to involve his green friends with his school work but he managed it! Hehe, homework can be fun then! My eldest son gets this type of homework too! OMG I dread when my kids move on to Secondary School when homework gets harder lol!